The thesis of Work’s New Age: The End of Full Employment and What It Means to You appeared in Sunday’s New York Times. The jobs crisis being permanent and not going away with better economic times was the theme of the May 19, 2013 Sunday Dialogue. The feature starts with a letter to the editor on a major current topic of the day, published Wednesday. It is reprinted that week at the top of the second Sunday Review page, along with responding letters and the original writer’s rejoinder. The main point of the letters was that the jobs crisis is permanent and will not go away with better economic times. The feature was also published online, at http://www.nytimes.com/2013/05/19/opinion/sunday/sunday-dialogue-an-economy-in-transition.html?ref=opinion&_r=0 . The New York Times, founded in 1851, is the largest city newspaper in the United States, with more than 2 million Sunday circulation. Its website, with 30 million different visitors each month, is more popular than any other news site. Work’s New Age is the 2012 IPPY Award-winning book showing what is happening with American jobs. It describes the true nature of the jobs crisis and why it will not end. The book shares how the work situation has affected and will affect national social patterns, and assesses a wide range of possible solutions. It concludes by naming what Americans must to do to shift successfully to the new jobs reality. Author James B. Huntington has spoken on Work’s New Age on over 130 radio stations nationwide. The book has also been featured in magazines, in speaking events, and in other newspapers. James B. Huntington, the letter writer, is most recently the author of Choosing a Lasting Career: The Job-by-Job Outlook for Work's New Age. He is also the creator and keeper of the AJSN (American Job Shortage Number), the key economic indicator showing latent demand for jobs in the United States. He also writes the Work’s New Age blog at http://worksnewage.blogspot.com/, and hosts a weekly radio program, WORK SHIFT, on WJFF 90.5 FM, a PBS affiliate in Jeffersonville, New York. He has an M.B.A. from the University of Phoenix and a Ph.D. in Applied Management and Decision Sciences from Walden University. He has also been a business professor, teacher, and professional speaker. He is married and lives in Eldred, New York. 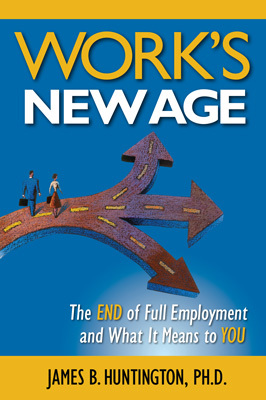 Work’s New Age is available at www.amazon.com, www.barnesandnoble.com, at bookstores (on the shelves or special-ordered), and from the publisher at www.royalflushpress.com or 845-456-0115. Kindle and Nook electronic versions are also on the market. Work’s New Age: The End of Full Employment and What It Means to You by James B. Huntington. Original edition. 5½ x 8½, 224 pages, 27 figures. ISBN 978-0-9835006-3-6. $17.95. See pressroom for a 300 dpi JPEG of the cover.